Special update this evening to bring you up to date on yet another storm that will graze us with some light snow tomorrow night into Monday morning. This storm will, like many this winter, develop in such a way that eastern areas as well as southern areas will see the most snow. As we have seen many times this winter, the storm will be developing too late to bring significant snowfall to the region however, with snow just coming to an end across coastal areas Monday morning, the commute will likely be slick. Snow moves out during the midmorning hours Monday before clearing takes place Monday afternoon. Here are my thoughts regarding snow accumulations. 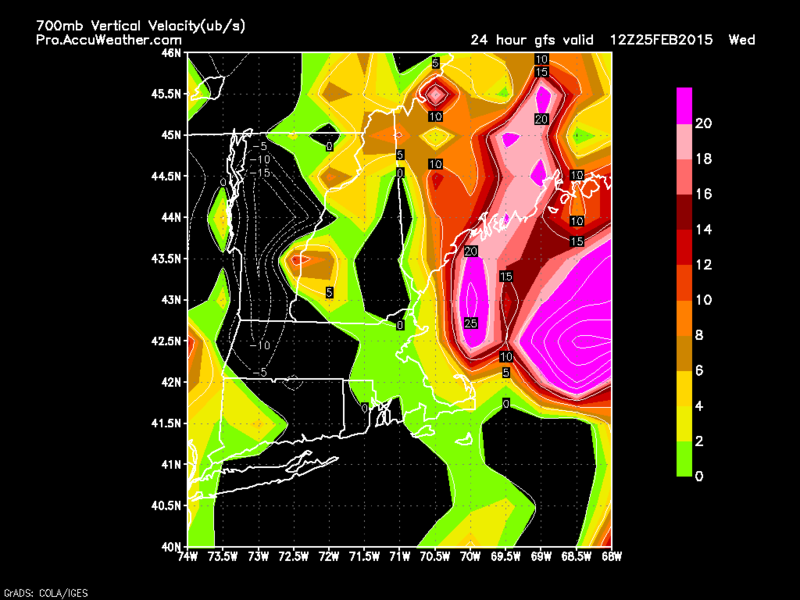 The Boston area looks to be the jackpot yet again while northern areas miss out. Another snow event looks to arrive on Wednesday and may involve some mixed precipitation for southern areas. More details later. Today will feature another quiet day in the weather world making this day number three in a row without accumulating snow. The last time this happened was January 20-23! Expect a bitter cold start this morning, where winds have gone calm temps are below zero, and where a light breeze still blows, single digits are widespread. Once again this morning, we are seeing some very sharp temperature differences caused not by inversions, but very localized changes in wind conditions. 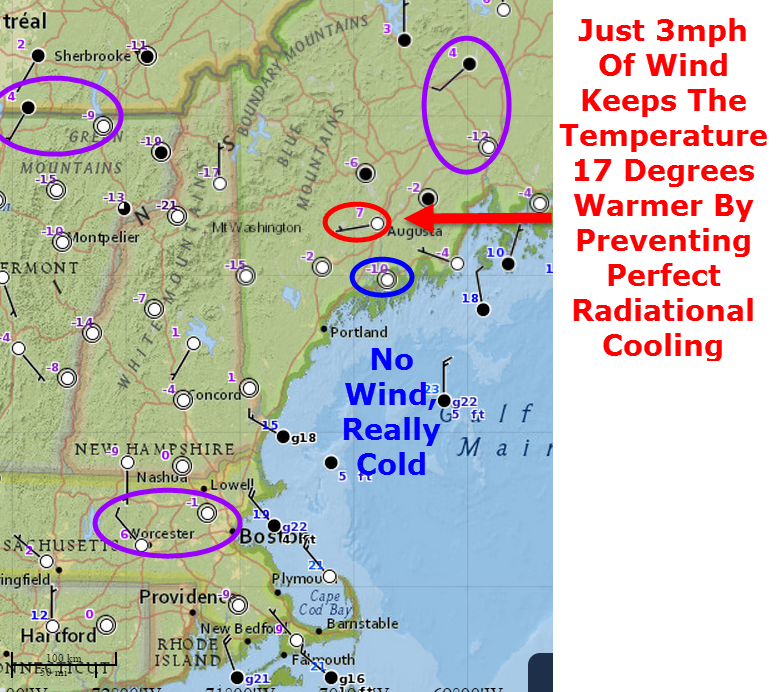 Where winds have gone calm, temps have dropped significantly below zero. Where a light breeze still blows, temps are much warmer. Take a look at a few observations from this morning. Here is a look at region-wide temps this morning. I have circled some of the sharpest couplets in purple as well as the blue and red examples. Here is the sharpest contrast I could find this morning. 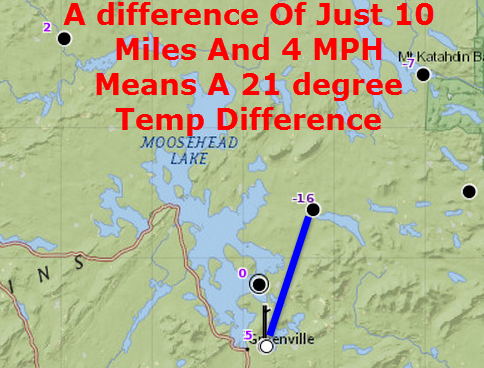 The difference between the two locations, approximately 10 miles at nearly the same elevation. The one difference? One station has a 3mph breeze while the other is completely calm. Temps rebound very quickly this morning as the sun comes up bringing highs into the 10’s up north and 20’s in the south under light NW breezes. Some high clouds are possible by evening across western sections but clear conditions should last throughout the daylight hours today. Snow makes a return tomorrow evening, I’ll have details in another post tonight. Another pretty mellow day weather wise today as high pressure builds in. Expect light winds, mostly sunny skies, and relatively mild temps. Expect highs in the 10’s up north and 20’s down in the south today which will feel pretty good under the high sun angle of late February. Expect a little dripping from the roofs and trees today as things heat up which will serve as a happy reminder spring really is on the way. Our next shot at some snow arrives Sunday. If you need something to cheer you up on yet another bitterly cold morning, a sizeable storm missed us. The storm that brought snow and ice to the deep south will be passing by well offshore and the only impacts we will see will be an increase in clouds especially over southern areas. 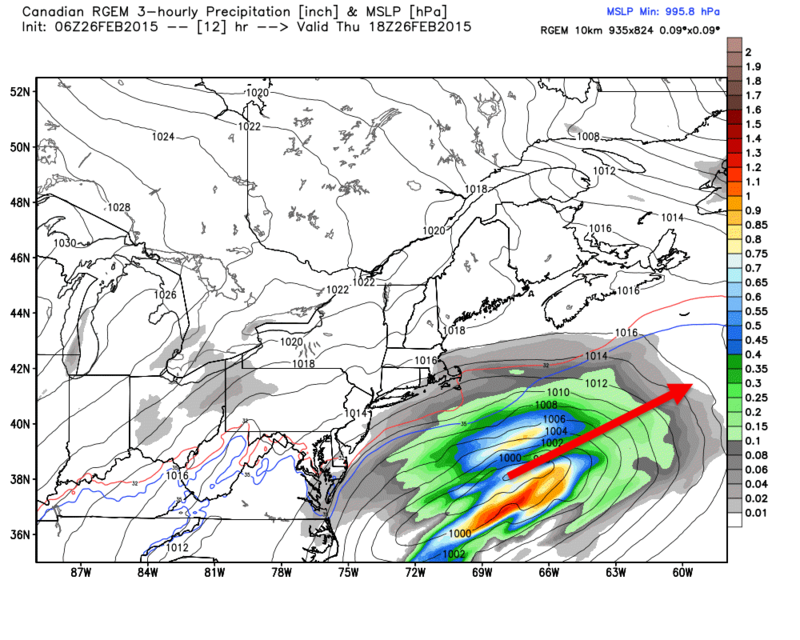 Areas SE of Boston will get in on some snow accumulating 1-3″. Temps will be cold but not frigid, in the 10’s up north with 20’s south. Clouds clear out tonight as the storm moves away and sunny but cold conditions look to make a return for tomorrow and into the weekend. No significant storms are on the horizon as of now but no significant warmups are either. 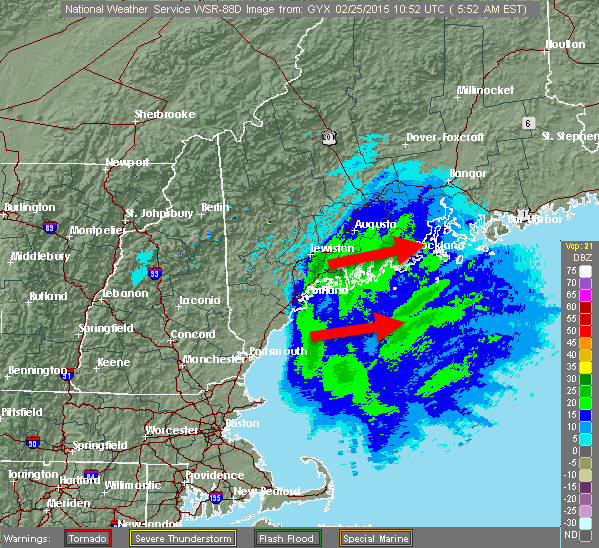 Snow is currently in progress over areas NE of Portland with the heaviest precip centered to the east of Brunswick. Expect light to moderate snow to end before dawn for areas to the west of Bath with snow sticking around through around 9 AM for areas to the east of there. After snow moves out this morning, NW winds will take over and we will begin the upslope/downslope cycle where the mountains squeeze out the moisture in the air causing clouds and flurries while the foothills/coast sees all the remnant dry air and thus clearing. 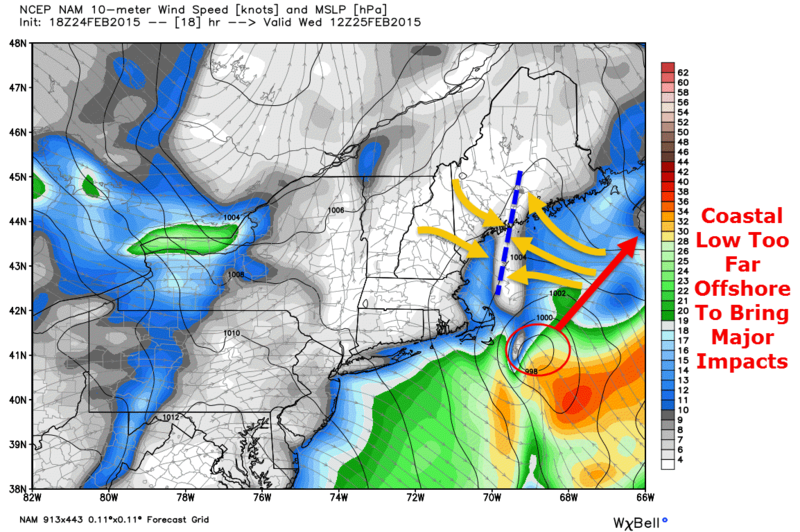 The moral of the story – mountain clouds/flurries, coastal sun. Temps will be in the 20’s for most with some 30 degree readings possible along the coast. Special update this evening to cover another Norlun trough type setup that looks to bring another round of light snow tonight and into early tomorrow morning. While the heavy snow bands usually associated with Norlun troughs will remain mostly offshore, an axis of shifting winds with reasonably impressive instability and some lift too will make an appearance mainly east of Brunswick tonight into tomorrow morning. 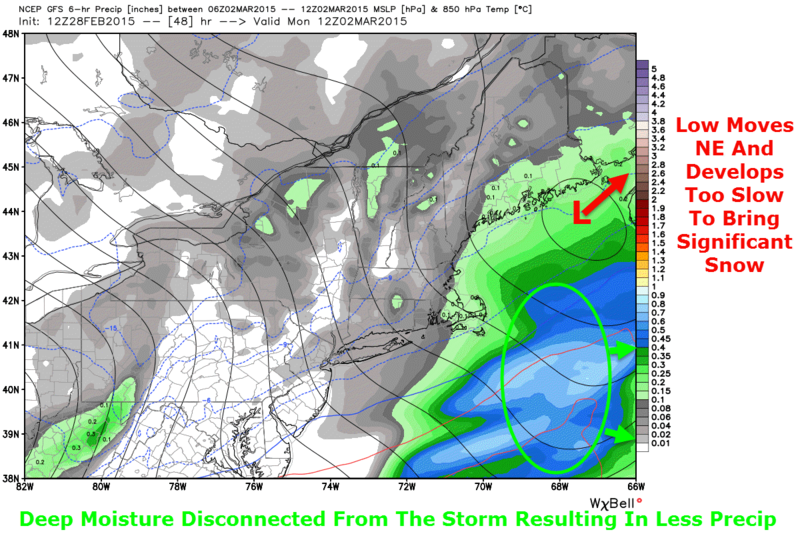 A low pressure area that brought snow and ice to the southeast US will move too far offshore to bring major impacts though a Norlun trough, basically a wind shift line, will extend to the NW of the storm bringing coastal areas some snow. Snow will be concentrated between 11 tonight and 9 tomorrow morning. While snow will mainly be light, especially west of Brunswick, some moderate to even heavy bursts of snow are likely across Midcoast areas. The map above shows intense upward motion across Midcoast areas tomorrow morning signaling bands of heavy precip are possible. 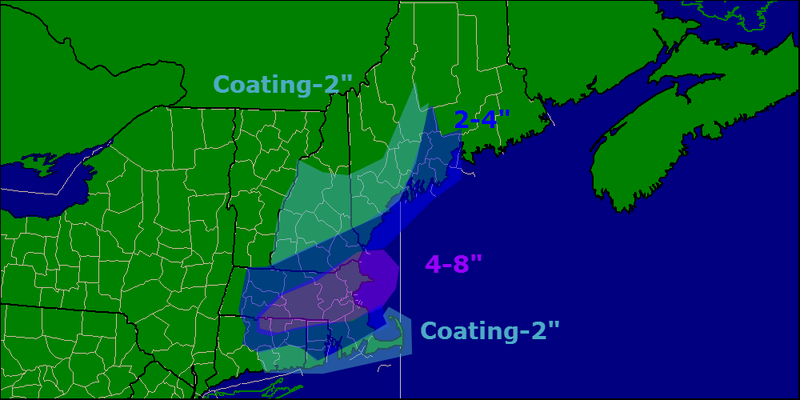 The areas most at risk for heavy precip will be east of the Bath/Brunswick area. 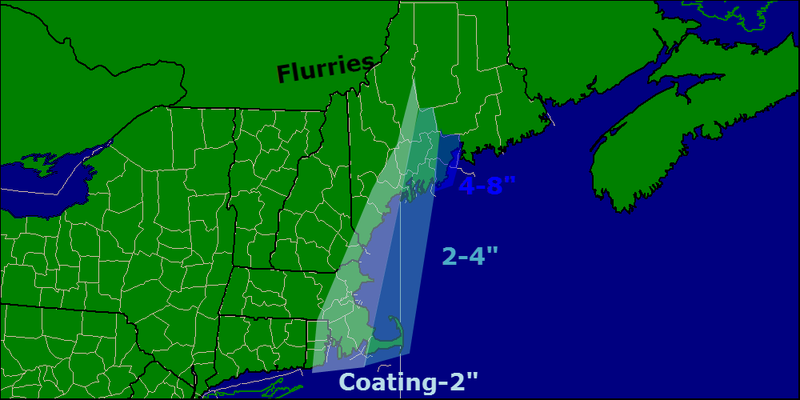 Here is the expected snowfall from this event. Not a lot, but the driveway will once again have to be cleared especially over eastern areas. @SurfSkiWxMan @capecodweather , it's a hybrid NORLUN.. impressive lift/instability..no question there will be +SN, question is for how long? In case you were wondering if this event was a Norlun trough, Weir Lundstedt, one of the two ‘discoverers’ of the Norlun trough (he represents the ‘lun’ part of Norlun) confirmed yesterday evening this did in fact look to be a hybrid Norlun event. It’s really cold out this morning. No, really cold. Temps everywhere are below zero, even at the coast. Most areas, except for the outer islands and peninsulas are in the double digits below zero and 20 below is not uncommon region wide this morning. The good news is that the wind has died down so at least we won’t have to worry too much about wind chill. Regardless, bundle up if you must venture out this morning. Temps will continue to drop until a little after 7 and will then rise swiftly as the high sun angle contributes to more effective heating. Some mid and upper level clouds will move in this afternoon and some coastal areas could see a low cloud deck move in as well later in the day but otherwise, another bright and blue one region wide today. One interesting little note on our temp map this morning (off NWS’s Enhanced Data Display) are the numerous, very sharp inversions. Inversions are very shallow warm layers that basically lock away patches of air at the surface and temporarily prevent them from being influenced by the rest of the atmosphere. There are several great examples of that this morning. 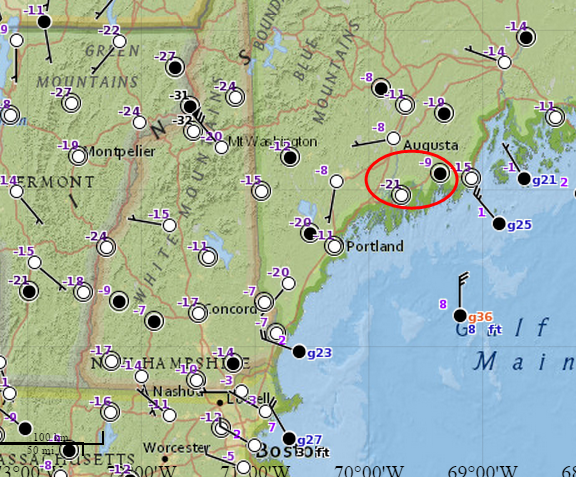 Wiscasset (the -21 reading in the red circle) sits at an elevation of 53 feet while Nobleboro (the -9 reading in the red circle) sits at 126 feet. While they aren’t far apart (just 10 miles) and aren’t drastically different in elevation (a mere 73 feet), the subtle differences of their locations and especially elevations have made an enormous difference in their temps this morning. Go up in elevation just a little bit and you may find it’s quite a bit warmer this morning. More snow is coming in tomorrow though it will be mainly light. More details in posts to come.